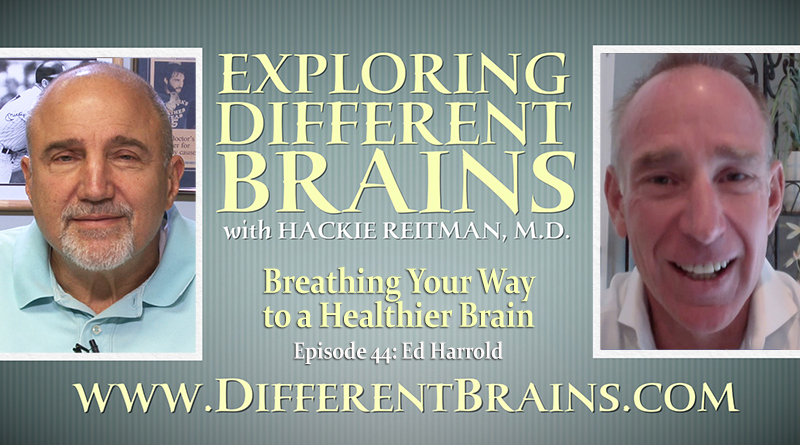 (24 mins) In this episode, Harold Reitman, M.D. 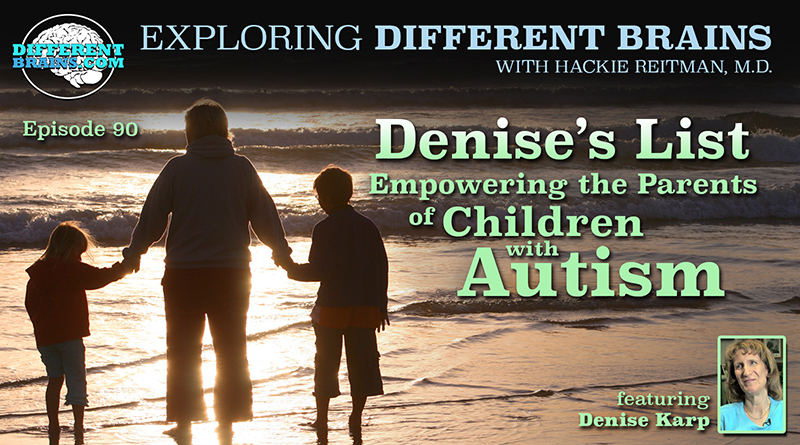 speaks with Denise Karp, autism advocate and founder of the yahoo autism parent’s group Denise’s List. The list focuses on services, resources, care, and advice for parents in South Florida, and is currently over 3,000 members strong. Denise discusses her own son’s journey growing up on the spectrum, how and why she created her online group, the challenges parents have securing resources, and the importance of spreading knowledge about autism. For more about Denise’s List, check out their home page. HACKIE REITMAN, M.D. (HR): Hi, I’m Dr. Hackie Reitman, welcome to another episode of Exploring Different Brains and today, we have one of my heroes here. Denise Karp, who’s the head of Denise’s list. We’re going to tell you what that is in a little bit, which is a Yahoo.com group and in it, if you have a different brian or your child has a different brain or you’re a professional in the area. Whoever you are, you don’t have to feel like the lone ranger because you can go to Denise’s list and everybody will help you out and welcome Denise. DENISE KARP (DK): Thank you Hackie. HR: Thanks for being here. DK: Of course. My pleasure. HR: Why don’t you introduce yourself and you explain better what Denise’s list is and what you’re doing. DK: Okay, I moved to Florida when my son, Noah, was three years old, he’s now 22 so 19 years ago. I didn’t know a soul here. I had a child with autism and I was still very unsure what that meant, what autism meant and I wanted to reach out to other people to find out what to do, where to go, who to see, have a social life, so I started a little online group and I called it after myself naturally because I’m vain, Denise’s list. we started with 30 people. It’s a list serv meaning that people can write in kind of like a bulletin board but it’s interactive because other people will write back to you and we started again with about 30 people. We’re up to I think just under three thousand list members now at mostly South Florida but we do have people from across the country and we do have several international members as well. HR: Now, one of the things I write about is, like in the “Aspertools” book on autism, Asperger’s, and neurodiversity, is we don’t want you to feel like the Lone Ranger and up until Denise’s list came along, many people down here just felt like they had nowhere to turn, they didn’t have anybody and now we can go in Denise’s list and get your emails and anybody has a question, ten people answer it. Now it’s over 3,000 people on there. HR: That’s great. Tell us about Noah. DK: Noah is 22 years old. He’s currently working at Walgreens, God bless Walgreens and the companies like them who hire our kids with autism, and he is working there three days a week, four hours a shift, part-time. He is right now doing two different jobs, he is stocking shelves and he’s doing expires. The expires are something that the regular workers at Walgreens don’t want to do. It means you have to go up and down the aisles, look at the shelves, see what’s out of date, pull it if it’s out of date, put a new one in there. They find it very boring. For Noah, he’s able to focus on this one task and and he does it very quickly and very well and they’re very fond of him at his Walgreens, where he works. HR: Now we were lucky we were able to interview Tom Derry from the, you know, Rising Tide carwash. DK: I was there this morning. HR: I take my truck there too. They do a great job and everything and has Noah done any work like that over there? DK: No! When rising tide first opened, I brought Noah over there and they said “Oh sure Noah. Fill out an application.” I said “Noah, you want to wash cars?” “No!” He is not a physical kind of a guy. He would not do that. HR: That’s the whole key is for all of us is getting to do something you like doing that you can make a living at. Maximize your independence. What is your educational background? DK: I went to school in New York high school then I went to New York University. I have a bachelor’s degree. HR: English. Do you do writing? DK: A little bit on the side. Nothing like you do. I’m a champion proof reader. HR: All right. Now in the “Aspertools” book, I called the moms, “pit bulls with an Angels mentality”, because they have to have a full-time job, they got to take care of their truth-telling autistic child who’s giving them a hard time, they got to fight with the medical establishment and doctors, M.D.’s, who unfortunately, up until recently received basically no training in this and now it’s starting to turn as within a lot of other areas and you got to fight with the insurance companies and you got to fight with everybody. What’s your day job? DK: I actually worked for a wealth management firm in Weston. I do compliance and operations for them. It’s actually a wealth management and a family office type of a organization. HR: Now do you feel that you have any Aspie or autistic traits yourself? HR: You see I thought anybody who does compliance has bit. They say it’s similar to the expirations at the Walgreen’s. I don’t know and you have other children? DK: I have a daughter. I have a 26 year old and she is. Years ago, I read a book called “Shadow Syndromes” by John, I can’t think of his last name, and in this book, he opined the theory that all the siblings of children with autism had a shadow syndrome of autism, not exactly autism but some of the characteristics of it and my daughter falls along there. She’s not diagnosed with anything but something it’s something there. DK: A lot of editing. HR: Tell me about the fussin’ and fighting in the autism community from your perspective. DK: Well there’s two big bones of contention among the autism crowd and the first is of course, vaccines. do vaccines cause autism or do they not cause autism? And each side is so firmly entrenched in their belief that no matter what you say, what proof each one comes up with, neither side’s willing to budge an inch, so that’s one problem and the other one is the diet. Should you be putting these kids on a gluten casein free diet? Should you not? Does it work? Does it not work? Well of course there probably is no medical proof at this time, the anecdotal proof is overwhelming. do you believe it or not believe it? Other than that, it seems that everyone seems to disagree with everyone else. HR: Another thing I find in social media is that 50% are always going to be mad at you. For instance, how would you say, I’m just giving them an example, a violinist who has autism. If you say an autistic violinist, 50% of the people get mad at you and if you say a violinist with autism 50% get mad at you. How do you handle that on Denise’s list, all of this? DK: I asked them all to please agree to disagree and if you want to call your child’s autistic, that’s fine, if you want to say he has autism, that’s fine. Whatever you want to do. I have found that it’s the lot of the aspies and the parents of the aspes who seem to prefer the autistic and the lower functioning, we are not supposed to say that’s not politically correct. For some reason, their parents prefer with autism and I don’t know why that is but I have noticed that. HR: Wow, that’s a very interesting observation. If a parent who’s just beginning their journey now, it was probably a lot smarter than I was when I begin my journey. HR: What advice would you give to them? They’re just starting their journey. They just wind and maybe the pediatrician said “Oh don’t worry, your kid will grow out of it” and then maybe they got the diagnosis somewhere along the line. What do you tell them? DK: Two things. The first thing they have to do is start networking with other parents. That’s the best way to find out what’s going on is through other parents. I like to think Denise’s list is a good tool for them because it does put parents together. DK: The other thing is first, start applying for government benefits immediately, right away, as soon as you’re able because it takes forever in this long waiting lists for everything, don’t wait, do it immediately. HR: What has been the biggest challenge for you at Denise’s list? DK: I guess the biggest challenge is being able to navigate through the land mines of different people with such strong opinions that they maybe they don’t mean to be nasty or insulting but when their own belief system is challenged, they lash out so Denise’s list is a moderated list so that means that I have to approve everything before it goes on this is the reason why it is still here 15 years later because otherwise it would people would have been stalking off in just Kai anger. That is the challenge. Keeping everybody civil and not distributing those posts that are not. I have to read every single one of the posts before it gets distributed. HR: Wow, how does our audience learn more about you and Denise’s list? DK: They can actually Google Denise’s list. That’s the easiest thing to do. It does come up or you can just go to google, it’s yahoo.groups.com/deniseslist. HR: Okay that’s great and do people access it just by like all the emails we receive or can you go online and look at all of them or how does that work? DK: You would have to join our listserv and again if you googled Denise’s list, it will bring you to our home page of the big blue button there that says “join this list”. You would have to actually join and once you join, you will have access to all our archives, all be posted everywhere going all the way back to 2002 and you can actually write into the list, right into Denise’s with a Yahoo groups com and you will see your note will get distributed to all 3,000 people and when they answer you, all 3,000 people will see the answer as well. HR: Do you intersect yourself with groups and advocates for other neurodiversities such as say Alzheimer’s or ADHD or is it just the ones that overlap autism, which never occurs in isolation. DK: Of course, now I’m pretty much strait autism. Yeah, a little bit epilepsy because my son does have seizures whether or not its actual epilepsy, we don’t know. It’s called seizure disorder according to the neurologist but I do a little bit of work in that area. HR: What do you think of the training programs that are present right here in Broward County, Florida for teachers, police, you know, other institutions. Do you have any opinion on that? DK: Well, judging by what went on in North Miami a couple of months ago, it’s obvious that training is badly needed where I live in Coral Springs as the police have been training by themselves at their own request but now the legislature did sign the last bill that police must be trained here in Florida and that’s really important because the police have no clue when they come upon our kids who may or may not answer when they get stopped who may reach into their pockets not realizing that the cop thinks they could be going for a gun and the training was definitely needed. As far as teachers go, when my son was in school, special education or autism in particular was not mandated. I understand that now it is. So that’s a good thing. HR: What do you feel is the biggest limiting factor in educating the overall public? DK: Well, I guess there’s still this stereotype that the young adults with autism are all have this one special talent that they’re all either great mathematicians or great musicians or great artists and you know people have met my son said “Oh, nice to meet you, what’s your special skill?” you know and he’s like “huh?” That’s one stereotype we really have to overcome and the other one is that just because they don’t and It probably a cliché at this point but just because they don’t talk, doesn’t mean they have nothing to say. They really have a great deal to contribute. They’re not always verbal and even the verbal ones, like my son, cannot always put in words exactly what he’s feeling and don’t take everything they say at word value. That sometimes they have a lot more to say than what comes out of their mouth. HR: Now does Noah live with you? HR: Okay, what is Noah doing socially at this point? DK: That’s a very sad story. There is just not much out there for these young adults with autism and we again he was in this art program on Saturday, circle of friends which is now ending. Friendship Circle has some nice events for this. Broward County has dances every quarter. other than that, there’s just not a lot out there. HR: Do you feel that the biggest challenges for your son Noah are social or other? DK: I think it’s social and behavioral and the two really intersect each other because he doesn’t really know how to behave appropriately, socially and we have a behavior program going to aim at just that subject but this is it’s a tough nut to crack and he has been known to to be aggressive and this is an issue for him that he has to work through. HR: Do you know of other groups around the country like Denise’s list or maybe for other neurodiversities? DK: I’m asked that all the time and I honestly do not. HR: You’re one of a kind. DK: I’m sure there are others out there somewhere but I don’t know what they are. I had the other day, a girl from New York called me and said “Is there anything down here like this? I need to find information on benefits, on respite, and you know.” I actually reached out to my list hours at any X New Yorkers here and we did get quite a few responses that were able to help her but from here, I could not find anyone in New York who ran a group like that down there. HR: What are some of the comorbidities you’ve seen with autism? DK: Epilepsy is the the big one these days and it does seem to just like autism hits more males than females. It seems that the epilepsy is hitting more of the males and the females as well and again there’s no medical basis for this, just whatever I have observed. HR: What’s your stance, if you have one, speaking of controversies, on medical marijuana? DK: I think it’s certainly worth a shot. My son is on very heavy medication. I takes a Topamax and Klonopin both to keep the seizures down to a reasonable level, we don’t get anymore a grand mouth but he still gets the petty melody every now and then. If I could take him off all those heavy meds and have him take some of this medical marijuana, I think it would be awesome. My neurologist says that Noah does not qualify for the studies because his seizures are not severe enough and they’re not often enough so he would not make it into a study but if it was freely available, I would be the first one online at the store. HR: And I’m finding that’s a very common attitude. I think that more people feel, based on their knowledge and experience what they’re able to piece together, that there’s a limited downside to it. HR: Certainly not as much downside as many of the medications are being prescribed badly and that’s not the doctors fault but that’s just the fact of life and you know the other thing is that what people don’t realize about double-blind studies and everything is that they have to have placebo and placebos work about 28% of the time or a lot of different reasons. HR: I am not aware of terrific downsides to the use of medical marijuana. There may be but I’m not an expert in it and I don’t know. There’s a lot going on with that. Is there anything else that you feel, any potent modalities or helpful therapies or medications or any nutrients that you feel particularly or helpful that maybe don’t get into the kind thought media? DK: I’d like to answer that the opposite way. DK: Is that one of my pet peeves is all the things out there that are very expensive that really don’t seem to do our kids any good and they seem to be really drumming it into them that you should spend money on this, he should spend money on that. there was that big bleach controversy. I won’t even talk about that. that was horrible. A little less horrible than that but just as expensive and just as useless. I feel the H bot of you know if you wanted to something like the diet. If it doesn’t work, at least it’s healthy. I mean you know, go ahead. It’s not going to cost you much more than go ahead and try it. I mean I tried it for my son, it did not work. 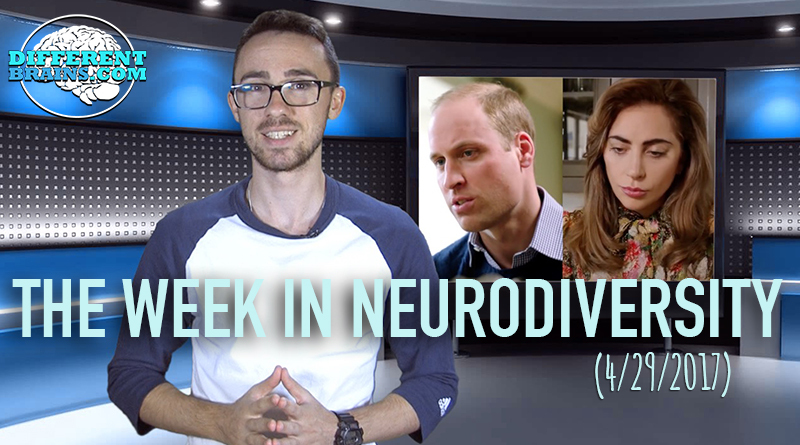 It’s not a cure for all kids but some of these things that are out there, they’re just crazy therapies that go back to the tried-and-true ones being the behavioral ABA. ABA works. It’s not only is it proven, I actually know one or two people for whom ABA has not worked but I know thousands and thousands who it has so it’s worth a shot. HR: What’s the one thing somebody like me has no idea about with autism? DK: That’s a tough one, but I guess I have to say that autism. When you have a member of your family with autism, it changes not only that person’s life but everyone’s life in the family and everyone who comes in contact with him. The medical staff that teaches the neighbors, the people he meets at the playground when they’re little. It’s kind of like you drop a stone in a pond and the ripples and and each person with autism, I like to think they’re like a walking ambassador for autism and sometimes it’s a positive thing, something it’s a negative thing but it does affect everybody and everything. HR: Tell our audience again how they get you. DK: Best thing to do is Google Denise’s list. We will come right up, go to our homepage, hit the little button that says join this list and you’re in. HR: How can an entity like different brains, what we’re doing, where we’re trying to get all the neurodiversities kind of under one roof. What can we do to be of help to your mission at Denise’s list for autism? DK: The best thing that you guys can do really is to bring everything out in the open and get it out there and talk about it and even if you don’t have any answers, just keep asking the questions. I mean that’s the most important thing. The autism awareness and all that. I know a lot of people looked at autism awareness month, so you know, it’s just a Public Relations thing. I don’t believe that for a moment. It is very important that people know how many people have autism, are autistic and it does affect everyone. Get the word out. HR: Well, we’re sure trying and I’m a big fan of LED cell from the Holocaust who said “The best disinfectant for darkness is light”, and you certainly at Denise’s list is shedding a lot of light on this very important. Thank you so much for being with us today. It’s been great having you. We’ve been with Denise Karp of Denise’s list here in South Florida. Google Denise’s list and you’ll see what comes up here. Thank you. DK: Thank you Hackie. It was a pleasure to be here. 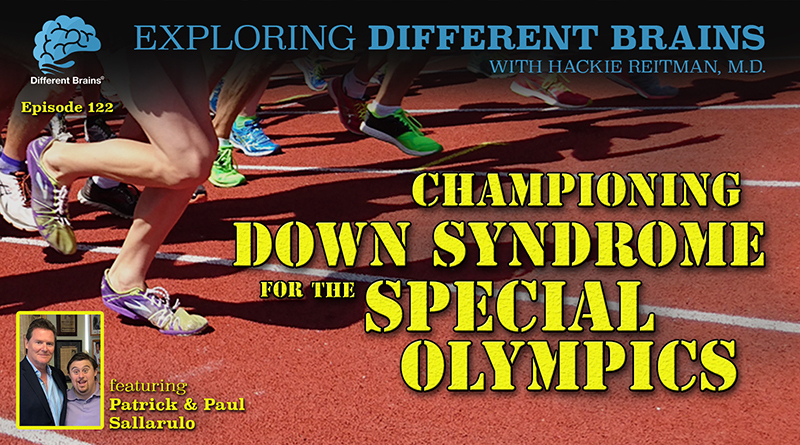 (14 mins) In this episode, Dr. Hackie Reitman speaks with Special Olympics athlete Patrick Sallarulo, and his father Paul.